A little girl named Jade, 6 years old, painted these pictures in her art therapy session and donated them to the That Adopted Girl National Adoption Month awareness art gallery show. She really wanted to help the cause and we were MORE than happy to add her pieces to the show heart emoticon. Jade unfortunately lost a parent to illness a couple of years ago so when she heard what foster kids experience she connected to it on some level. She said that she could be in foster care if she had lost both parents, which she really hopes never happens. Both of Jade’s paintings sold today!!! Imagine, 6 years old with a huge heart wanting to help raise awareness for other kids, and now also having sold her first art pieces! Thank you SO much Jade for your contribution! YOU can join Jade by making a contribution to the awareness campaigns, empower hours and other life changing programs at www.ThatAdoptedGirl.com. The That Adopted Girl ‘ Forgotten Futures’ gallery opening last night held at EDEN Art Studio and Gallery in The Arts Factory was awesome! We are immensely proud of this awareness campaign during National Adoption Month. The campaign and the opening night manifested almost exactly as we envisioned! The vibe was just right with music by Vertex, wine from Khoury’s Fine Wine and Spirits , gourmet popcorn from Popped and incredible people from across the Las Vegas Valley. The pieces in Forgotten Futures were created from the hearts, minds and experiences of foster youth, former foster youth and local Las Vegas artists. They are inspiring and powerful, and they speak volumes about the kids in the foster care system and of adopted kids across the U.S.
A BIG thank you to everyone who came and showed support, made generous donations and purchased some of the art pieces. We had so much fun and are excited for the next 2 weeks of the show! Take some time this week to experience Forgotten Futures by That Adopted Girl. You can visit the gallery anytime between now and December 4th at EDEN Gallery at 107 E. Charleston Blvd. Also on closing night December 4th the whole team will be at the gallery 6-10! If you would like to visit the gallery show, it is up until December 4th (First Friday) at the EDEN gallery at 107 E. Charleston Blvd! What Are You Supposed To Say During National Adoption Month? It is National Adoption Month – an entire month dedicated to the population that That Adopted Girl Inc. serves and I have been struggling. I have been struggling with determining the way to powerfully get the message about foster care and adoption across to the general population this month. Truly I have been struggling with what in the world “the message” actually is or what it should be. Is “the message” that we need more foster parents in the U.S.? Is it that we need more people to adopt children from the U.S.? Is it that we as a society need to look out for these kids and care for the kids while they are in the system, whether we are foster parents or not? Is “the message” about the effect adoption has on kids? Is it about the effect that foster care has on kids? Is it to focus on WHY there are so many kids in the system each year and how the root of the problem can be dealt with? Is it shining a light on the stats about adoption/foster care and mental health, suicide, eating disorders, learning difficulties, addiction and attachment issues…? Is it about the issues within the foster care system? Is it about the experiences of children within the foster care system? Is it about the experiences of adopted kids? Do any of these messages have power without the others? Is there one in particular that would get more people to really care? Most causes have one strong message, and everyone who cares deeply about the cause stands together and perpetuates that one message. Then, over time that message becomes well-known among the general population. When it comes to foster care and adoption there are so many issues to focus on. Everyone who cares about foster care and adoption recognizes each of the issues within the cause, but do not all agree on which issue is most important. Therefore, unlike many other worthy causes, this cause lacks a solid single message. Then, is it possible that it is difficult to get people to act because they are not sure what they can do to help? They don’t know where to focus and they believe that if they aren’t going to foster or adopt that there isn’t much they can do? Are foster child advocates confusing people by having so many different issues within one cause? Is it overwhelming? Is that why we are struggling to get more people to care? I’m talking autism awareness/breast cancer research/animal rescue – level caring. HOW do we get people to care? How do we get people to do more than say “oh that’s so sad” when they hear about foster kids? How do we get people to DO something, to take action, to pay attention? Or at the very least to donate so other people can do something about the issues? WHAT do people need to hear in order to realize that it is really important to our society as a whole that we collectively give a $#!+ about our kids in the foster care system? Have foster kids been written off as a First World problem? Are they not important enough to care about? Or is it that when people donate to care for orphans in Third World countries, the people pitied are “others” – separated from the great U.S.A? Is it that if people were to focus on our foster kids they would have to pity their own, and admit that there are some Third World status issues happening within our First World, family values oriented country? PLEASE correct me if I am wrong. I think it is crazy that there are hundreds of thousands of children without permanent families. Seriously. As a child, isn’t having parents a natural-born right? A human right? What is it about the kids in the system that makes them unworthy of that human right? Children are our future. Right? How can we as a society justify forgetting hundreds of thousands of futures every year? How do child advocates raise social awareness to remind everyone about the large population of forgotten futures? We should be doing EVERYTHING possible to help these kids while they are in the system and to help these kids get out of the system. Focus on their personal development and self-worth while they are in the system like That Adopted Girl Inc. does. Pair kids with supportive families like the Dave Thomas Foundation does. Provide some dignity by replacing garbage bags with duffel bags for carrying belongings from home to home like Together We Rise does. MOST IMPORTANTLY, how do we get people to realize that this is a HOPEFUL cause? How do we explain the dichotomy of intense struggles with an immense desire and potential for light, growth and success? How do we enlighten people to the fact that foster parenting is not the only way to make a positive impact in the lives of these children? Yes, there is an immense need for more quality foster homes. 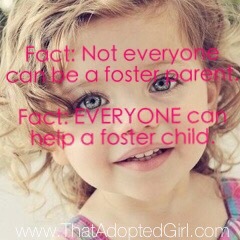 But, if you are not able or prepared to foster a child, there are other ways to help! Our overall goal with any cause is for people to act, donate and care. If we can reach people and get them to act, donate and care…then those people can tell other people and the movement to improve the lives of America’s children will grow exponentially. I guess, take whichever issue that you think is most important and compelling within the cause and frame your message with “Act. Donate.Care.” in mind. For newcomers, choose whichever issue you think is most important and compelling within the cause and stick to that for now. The That Adopted Girl Inc message this year will be: There are some great kids in the foster care system. It is really important to our society as a whole that we collectively give a $#!+ about these kids. Let’s join together to raise social awareness and improve the lives of America’s children! From November 7th to December 4th (First Friday) The Eden Gallery will host Forgotten Futures – an art collection bluntly illustrating issues with the foster care system and adoption. Art pieces depicting issues with the foster care system will be created by local Las Vegas artists. Other pieces are being created by teens in the foster care system, depicting their real life experiences of the system from the inside. Las Vegas artists are welcome to contact coordinator@thatadoptedgirl.com for questions about submissions. “It is important to not sugar coat things. When we look at things for what they are, we can move toward change, or at least social awareness. The art in the Forgotten Futures awareness campaign illustrates adoption and foster care issues in an upfront and easily digestible way. Our goal is to get people to pay attention.” – Juliana Whitney, Founder & President of That Adopted Girl Inc.
That Adopted Girl is a 501(c)3 non-profit organization founded by Juliana Whitney, an adopted girl, in 2014 to improve the lives of America’s abandoned children and to raise awareness about foster care and adoption in the United States. EDEN [Art Studio & Gallery] is Las Vegas’ venue for compelling contemporary art. The gallery is committed to presenting intelligent and culturally relevant exhibitions featuring work from some of today’s most dynamic artists with growing local and international reputations. Established in 2014, located in Las Vegas’ downtown Arts District, and under the guidance of Eden Pastor and Justin Lepper, EDEN is one of the best places to spot Las Vegas’ up-and-comers as well as established artists as it presents a vital force in the Las Vegas art scene with an emphasis on painting, urban art, and illustrative works.